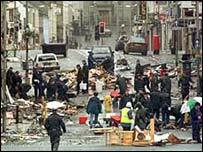 A second forensic scientist has called into question the DNA evidence at the Omagh bomb trial. Professor Allan Jamieson said in his view, low copy number DNA was unreliable and the test results were open to interpretation. This technique, where DNA profiles can be obtained from samples with only a few cells, is an important part of the prosecution's case against Sean Hoey. Mr Hoey denies 58 charges including the murder of 29 people in Omagh in 1998. Belfast Crown Court heard that molecules used in low copy number DNA were the size of a millionth of a grain of salt. Giving evidence for the defence, Professor Jamieson said that in his opinion, the less DNA being tested, the less chance there was of a reliable result. Also giving evidence on Thursday was a forensic scientist in the unit specialising in the technique, who examined items in this case. Samantha Underwood said she wore a lab coat, hair net, gloves and face mask to prevent contanimation of exhibits as they were being swabbed. She said it was common practice to change gloves between swabs, but said she and her colleagues shared lab coats that were cleaned once a week. # posted by SAOIRSE32 : 3:07 a.m.